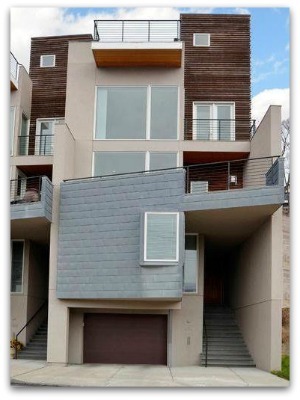 Nobody would ever suggest that that it’s easy to find contemporary homes in Cincinnati! Most of our homes fall into the category of traditional. Over the years, the interiors of the Cincinnati 2 X 4’s (4 bedrooms, 2.5 baths, 2 story) have evolved to a more open floorplan. And when it comes to usuable living space- home owners can’t beat a 2 story home- especially when the lower level is finished. However lots of local Cincinnati buyers are looking for more contemporary or mid-century modern architecture. Searching the Multiple Listing Service of Greater Cincinnati for specific architecture types broken down between modern and cotemporary is useless. A standard search of the CincyMLS for active residental properties and you’ll find over 6900 properties. Search for contemporary- 100+ listings appear. You can’t search for modern -because it’s not a searchable field on our system. Many of the contemporary and modern homes styles are listed as transitional homes -currently 650+ active listing- because many buyers won’t look at listings advertised as contemporary/modern. Some agents specialize in finding specific styles of architecture for clients. Most agents are very familiar with what’s their market areas and know who to contact if they to find unique houses. Best advice to buyers- if you’re looking in a particular neighborhood with a wide variety of architectural types keep an open mind and look inside before making a decision. Many buyers have their mind set on a specific style and often miss great deals on homes that meet all their requirements just because internet search limitations.